Here are the Armies Army Enemy Unknown all done. I had real trouble deciding on a colour scheme for these and almost did them (space)Wolf grey. I went with this scheme with modern video games loosely in mind. It's a light grey/dark grey with teal lights. The dark grey parts were an afterthought that really tied them together, but was quite a bit of effort to get looking right. Working with two tones of grey as main colours is tough to balance. Luckily, these sculpts have quite a lot of hard edges on the face and armor to highlight. The eyes were just washed with thinned teal paint, then dotted with white. I'm pleased with the result to effort ratio! I liked it so much I went a bit nuts with some OSL on the support weapons and leader's arm computer. Inspired to do more lighting effects, I finished off the Russian Empire figures, as I had a few specialists left to do. These guys (and some un-pictured troopers) rounded out the Russian Empire figures I ordered. 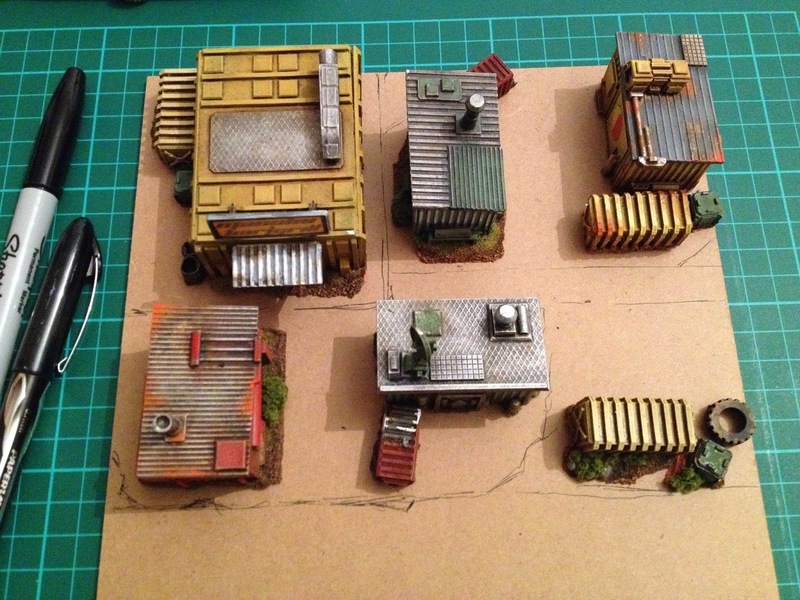 With what I have painted, a campaign around a platoon and it's assets can be easily run. 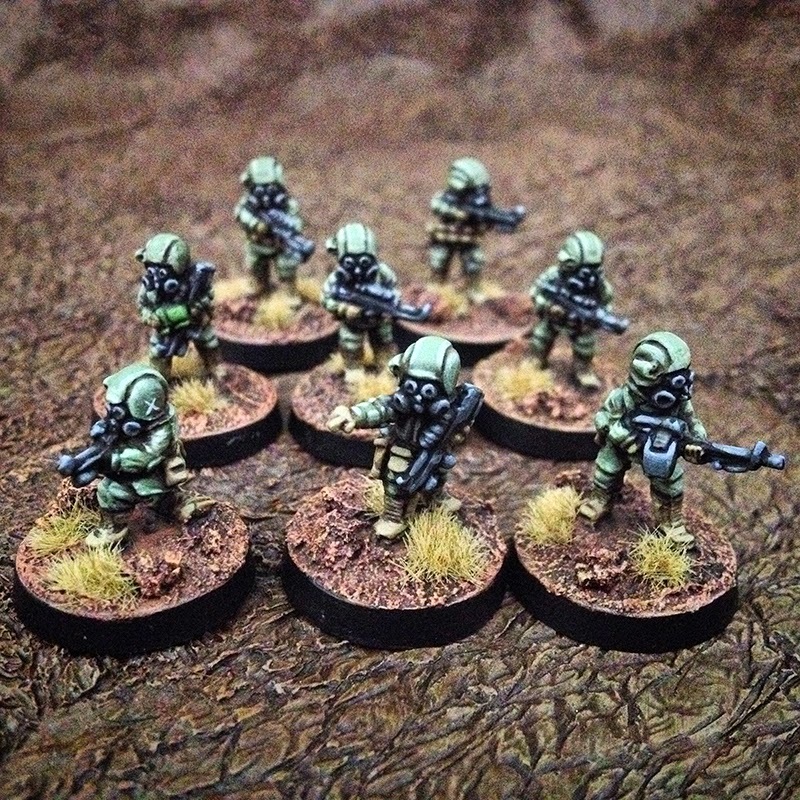 These specialist just ooze character, and were a treat to paint. While I was on a teal lighting kick, I threw on some glow on the chap's iPad. The extra splash of colour really helps liven up the unit, as the basic uniform is suer-drab. All the figure's scopes got a teal lens and highlight too, although barely visible. Exhausted by all this output, I dragged out the remaining bits of city ruins in my collection and re-based them in front of TV. There is a lot of dry brushing in my future, but its very satisfying to have my terrain all shaping up cohesively. 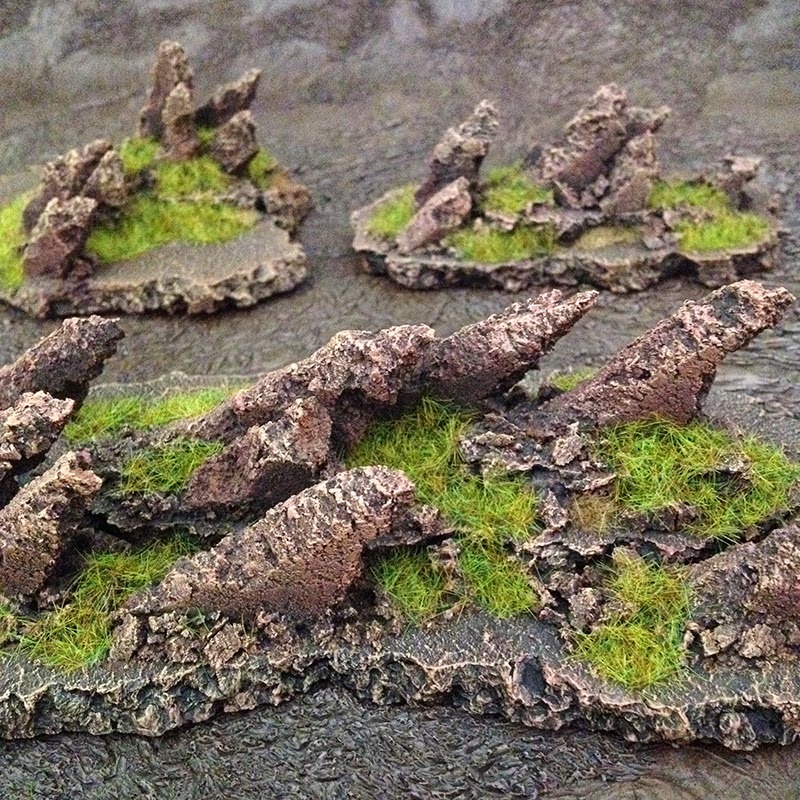 As part of my campaign to refresh and unify my terrain collection, I decided to turn my old stepped hills into rocky outcrops, as they were really too shallow to be very useful. I recently bought some cork trivets at Tiger to make thicker hills with, and the offcuts came in handy for shaping into slanted spires. These were superglued to the hills, then crumbled cork glued into the gaps with PVA. A mix of 50/50 PVA and burnt umber craft paint was employed to basecoat and seal the fresh cork, then 2 layers of drybrushing finished them off. Some static grass here and there, job done. These will combine nicely with both my shanty buildings and jungle pieces. 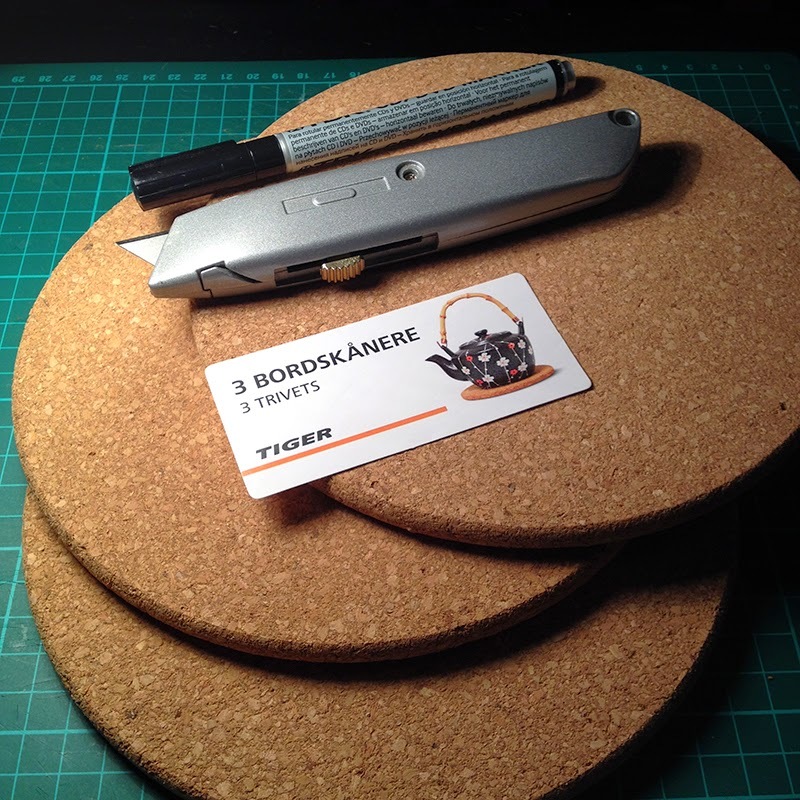 If you're working in 15mm, you really don't need to bother with polystyrene or pink foam... Cork is heavier, stronger, easier to glue, easier to paint and less toxic. I finished the first 8 figures from Armies Army Russian Empire range yesterday. I love these sculpts, they paint up very easily, striking the perfect balance of interest and simplicity to keep plowing through them with minimal fuss! One secret to getting through a lot of figures quickly is a small number of colours. These only have 3 main colours on them, so the process is very simple. Long time readers (well done for enduring the huge breaks in transmission) will know I'm not known for doing a lot of tutorials, due to basic laziness. But rejoice, a brief one follows! As you can see above, I painted in all the base colour before proceeding. This is an approach I use when employing an all-over wash, something I have adopted recently. I went with Army Painter Army Green for most of the figure, with Vallejo Khaki for webbing, boots and gloves, and P3 Ironhull grey for guns and gas masks. When dry, an all-over wash of Army Painter Strong Tone is applied sloppily with a flat brush. While wet, I quickly dab the point of a damp brush into any places the wash has pooled too much, to draw some of it out. When that is dry, I do some pin-washes. This is a fancy way of saying painting just some wash onto the areas it requires, instead of all over the figure. On these guys I went over the grey areas with some Citadel Badab Black wash (any black wash or even diluted ink would be OK) to darken them some more. After that, each area was highlighted with it's original colour, then again just on the edges with the original colour plus some white. I eyeball the mix, but it's probably about 20% white to colour. All done! Almost. It's been a while since I did military figures, and I felt like adding some extra detail. 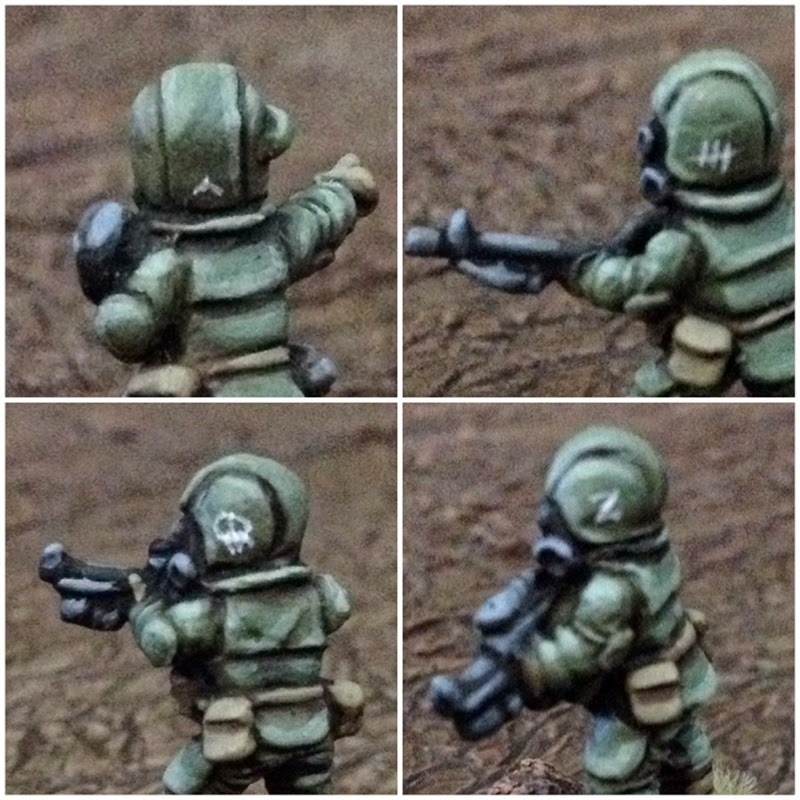 The back of the leader's helmet got a chevron, then I tried a little graffiti on a few other helmets. It proved a little beyond my skill, so I stopped at what you see here. I think it may help me distinguish the soldiers when I start playing the new revised Fivecore campaign. This last part really pushed the limits of my eyesight... And my iPhone 4s camera. I think I'm going to need short-focus glasses at some stage, or maybe one of those magnifying visor things I've avoided for so long. There's another batch at stage 2 sitting on my coffee table, alongside some Enemy Unknown. After that I think I've run out of bases again... Time for another Em-4 bases/brushes order! I made a small order from Armies Army recently to clear out some PayPal funds. 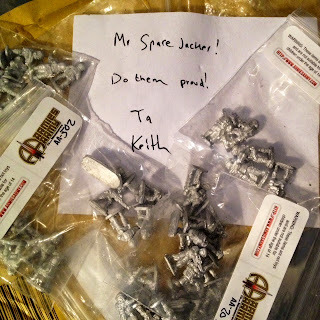 Keith kindly threw in some very cool freebies and I'll be painting them up this week. I've been a fan of AA models from day one. Great stuff, time to go military for a spell! Planning is always a good idea. My mind continually re-assess my terrain collection. It's almost a sickness. As I have moved so many times in the last couple of years (Back to Australia, Back to the UK, and now a new flat again) I don't have the luxury of storing it all out of sight and mind. 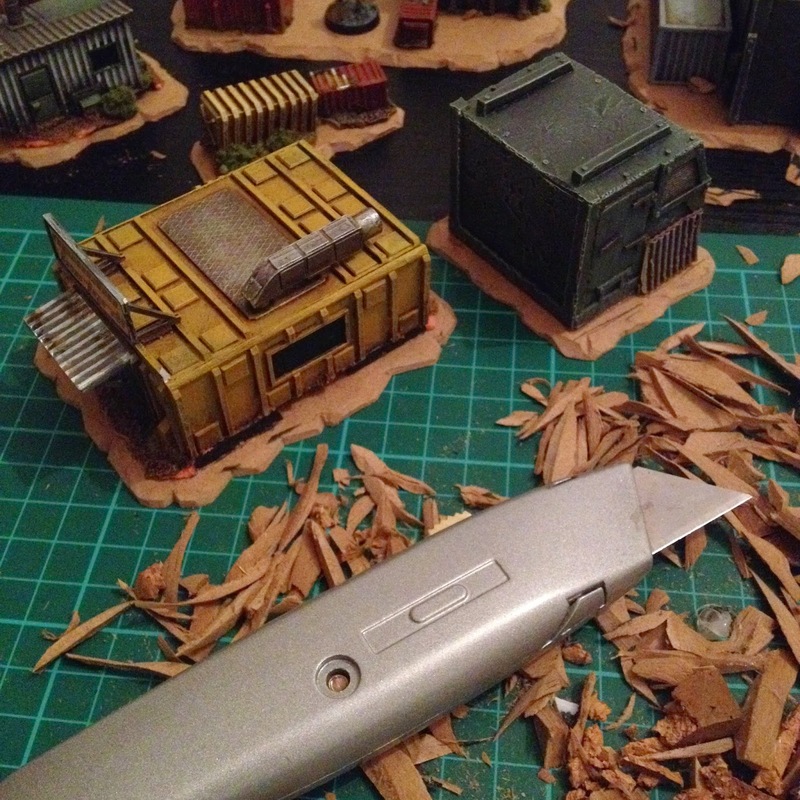 Building terrain is probably the most therapeutic aspect of the hobby for me, and I'd say i devote a lot more time and energy into it than actual miniatures, although it is never my intention. These models are from GZG, and are all-metal kits. They were the first terrain I purchased when I returned to minis in 2010, and they have held up very well indeed. There is certainly something to be said for the durability of metal buildings! 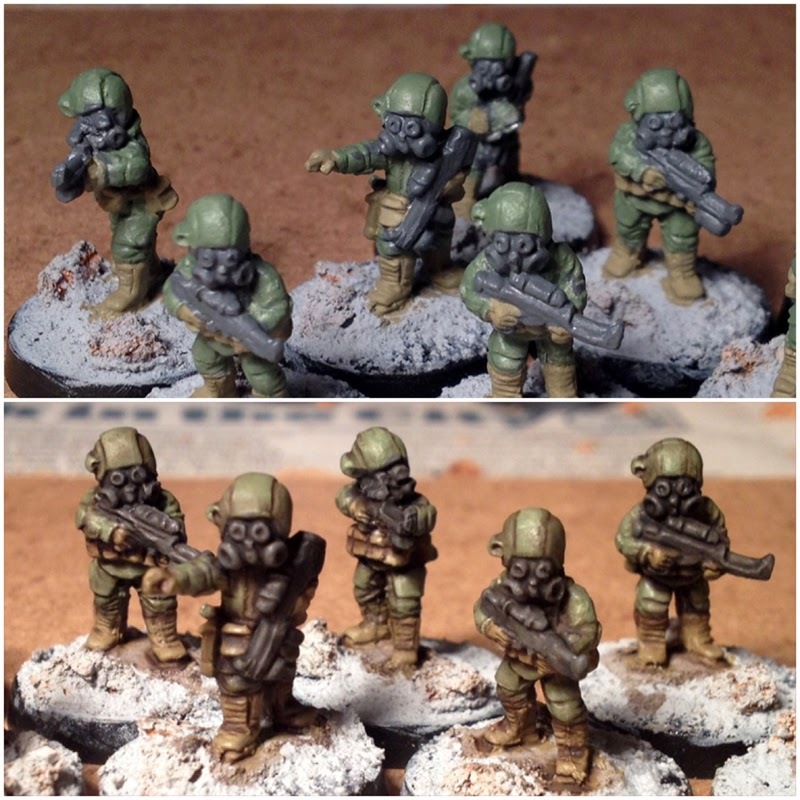 The only problem was that when I painted them, after originally basing them on CD's, I had the really odd idea that uniform straight-edged basing would be a good idea. It's not. 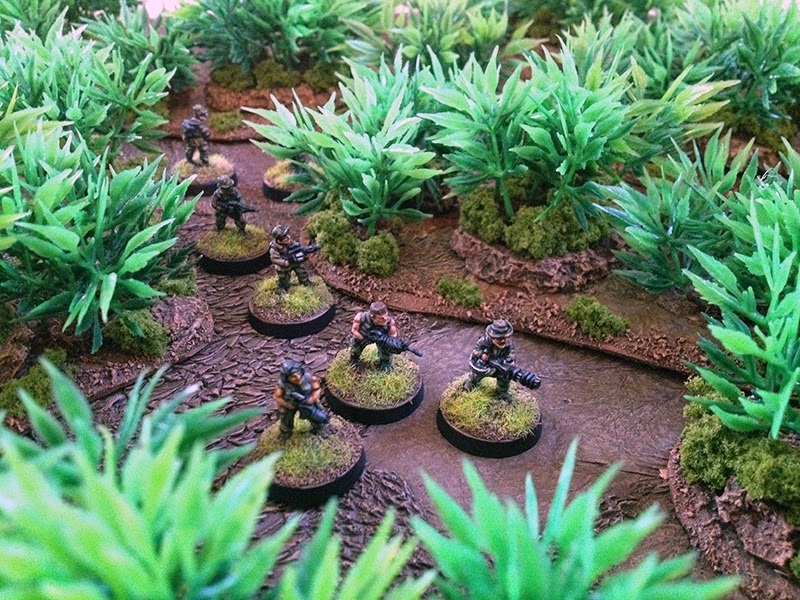 I decided to re-base them for a third time to fit in with the jungle terrain pieces I made last post. This time around, I decided to return to making small clusters of terrain rather than individually based small buildings. I have come to believe this is the best way to store and set up this sort of terrain, and makes for a pleasing mini-diorama to work on. I am also determined to unify my basing scheme once and for all. Nothing bothers me as much as mismatched terrain bases (with the exception of people using medieval farmhouses in Sci-fi battles, the ultimate transgression). I should give a shout out to Chris/Deserter86 for inspiring me to do this. His heroic quest to unify his basing is inspirational! Next, I arranged the buildings into little clusters and roughly sketched the shapes onto the MDF. Then used a Stanley knife to cut rough shapes. I whittled down the edges to make rough gradient. Easy enough, but if you try this make sure you use a sharp blade. As the blade dulls, it becomes harder to cut and you inevitably apply more pressure, which is where cut hands start happening. I was careful and sustained no injuries. Always check layout with test minis before glueing! Naturally, I got over-excited and tore into my city ruins terrain immediately, which has no less than 3 types of basing style and was in urgent need of refreshing! Something else that I wanted to do was fix a glaring error I had made when first building these ruins... No rubble! Mr. Dave Taylor pointed this out to me and he was so right. The rest of the evening was devoted to crumbling up cork tile and cutting up little bricks to make rubble piles. The only reason I stopped is because my hands were hurting from cutting the MDF (it takes some effort) so I decided to hold off before there was a mishap or hasty creative decision. Tonight I'm going to force myself to stop messing about with terrain and paint some overdue models for Khurasan, and then maybe get into some more of this. After years of putting it off, I've finally built some jungle/forest terrain. Why the wait? 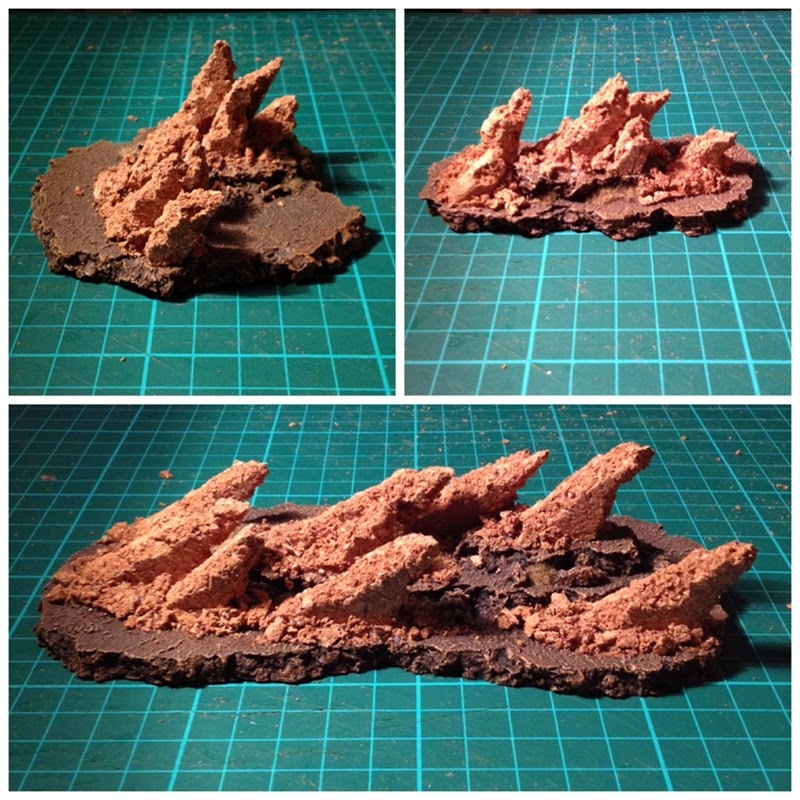 In the distant past I have made several different types of forest base, usually for GW gaming. I was never happy with my results. Here is what I came up with: Organic shaped MDF bases with a few plants strategically fixed on. Inner "plugs" of plants that fill the gaps but can be lifted out to place troops inside. 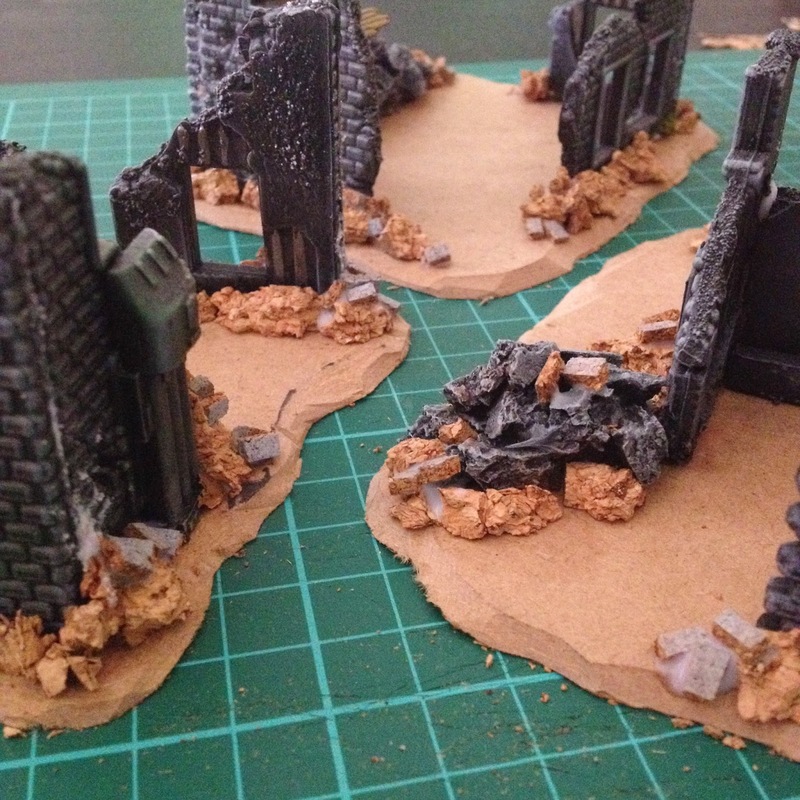 In a pinch, the plugs can be used as individual terrain pieces and the bases left more sparse. I have tried to split the difference between looks, game function and durability (while being as cheap as possible) and am very happy with the result. I used 3 of these soap dish inserts from Tiger ( a cheap shop in the UK) for 3 pounds each. I am sure I could have got the same plastic plant cheaper on eBay, but this exact type of plant is difficult to find and it was an impulse buy. The dishes are quite handy as drawer organisers so not bad value. For bases, I cut up some 2mm MDF that I had previously (and very foolishly) used to glue pieces of a Zuzzy mat to in an attempt to make modular street tiles. I used a stanley knife with a new blade. I whittled the edges down to a slope, then used PVA glue to stick dried coffee grounds on as texture to cover the exposed MDF. Next, a hot glue gun was employed to stick some clumps (2 or 3 depending on base size) of plant to each base. More coffee grounds and PVA to cover the hot glue. The remaining plants were hot glued onto (you guessed it) pieces of broken-up cork tile, each one fitting into a gap on the bases, but not glued in. Cork tile is weighty and grippy enough not to move, and soft enough not to damage anything it's sitting on. More PVA/coffee ground to hide the hot glue. A sloppy round of craft paint acrylic burnt umber was slathered onto all the coffee parts to blend them into the bases, followed by two lighter shades of brown dry-brushed on top. Finally, some clump foliage was added. I plan to stick on clumps of static grass in future, but it's in the post right now. Still haven't managed to get any figures painted recently, but hoping to in the next few days. I have a ton of stuff from Khurasan waiting, and I just ordered some new Armies Army toys that should arrive soon.